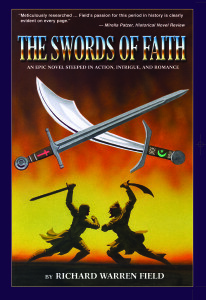 Field, Richard Warren – The Swords of Faith – Strider Nolan Media, Inc.
Richard Warren Field’s novel won the Bronze Medal in the Historical Fiction – Military/War category of the Independent Publisher Book Awards. Over 2,000 books competed for awards in 69 categories. The Swords of Faith tells the story of a military confrontation, with two fascinating characters of the Middle Ages, Richard the Lionheart and Saladin, going head-to-head. But few realize how much these men had to set aside fanaticism and cooperate to bring hostilities to an end. That is the emphasis of The Swords of Faith: a rejection of religious fanaticism in favor of religious tolerance.